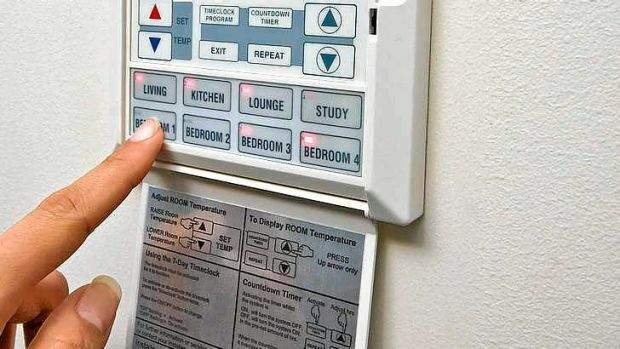 Flicking a switch present in thousands of Victorian homes could save thousands of dollars in heating costs, according to researchers at the Melbourne Energy Institute. The Institute’s report says that large Victorian homes could save as much as $658 a year if they switched off gas heating and increasingly used air conditioners with “heat pump” technology in them. Across eastern Australia the analysis finds there could be up to a million households, a large proportion in Victoria, which already have reverse cycle air conditioners installed but do not currently use them for heating. Up to a million households have reverse cycle air conditioners but don’t use them for heating. “It is possible that in Victoria alone, households could collectively and immediately save on the order of $250 million per year simply using the reverse-cycle air conditioners they already have in their homes for space heating,” the report says. Heat pumps are an electric technology that brings outside ambient heat into the home for warmth. The authors say the efficient technology can heat a room as comfortably as gas-ducted heating and other electric technologies, but at much lower costs. The analysis by the Melbourne Energy Institute also looks more broadly at the changing dynamics of the gas market across eastern Australia, saying its use peaked in 2012 with less gas being used for power generation and by industry. But despite the decline, gas prices have been rising because of booming exports. While a further decline in gas use has been forecast by energy market authorities, the Institute suggests it could be much steeper than expected because new technologies can “disrupt” the use of gas in households and allow consumers to move to cheaper alternatives. Besides reverse-cycle air conditioners, the report also points to heat-pump water heaters, other gas-free water heaters and induction cooktops. The switch from gas to electric heating and cooking in homes would also free up the resource for more valuable use in industry, the report added. The report has been prepared as a significant social and environmental debate is taking place about the extraction of new unconventional gas sources such as coal seam, shale and tight gas. In Victoria a moratorium is currently in place preventing new exploration and development of unconventional gas. The state government has launched a review into whether a potential industry should be allowed in the state. The report was in part funded by farmers in Gippsland and western Victoria who are concerned about coal seam gas exploration and who wanted to test whether new development was needed to meet domestic demand. The left-leaning Australia Institute also helped fund the work.